Home Food Ming Kee Chicken Rice: Steamed Chicken is Best Served… COLD? You are walking around the neighbourhood food court looking for something to enjoy with your family on a hot summer day. An image of a nice cool Ice KaChang cross your mind as the heat of sun’s waves continue to soak your shirt. Your mind starts to think of the beach and ocean, and suddenly you are thinking, “ Maybe I should finally leave this god-forsaken, one season having, island. ” Thoughts of a bowl of refreshing Korean Cold Noodles on a day like this causes your mouth to water. But just as you were about to start complaining to your parents about your country of birth, you spot a long line. 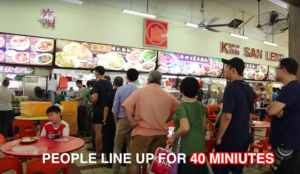 Your Singaporean instincts kick in, and without hesitation you are already queuing up while counting if you have enough leftover coins to pay for the food. You look ahead and see that there are no chicken hung on the rack, but as you examine closer you see that in actual fact, once the chicken is cooked, it will be dunked in ice water and it will be left there till it is ready to be chopped. This is probably not your idea of the stereotypical refreshing dish you are looking for but, this iced chicken’s tenderness will refresh your love for Singapore’s good old chicken rice. Ming Kee Chicken Rice: The Secret of Tender Chicken. ICE? Many people who come to Ming Kee Chicken Rice for the first time, may think that the shop ran out of chicken, as there are no chicken being displayed. But the regulars who queue up 30 to 40 min regularly will know that the chicken is being chilled in a bucket of ice. Why ice steamed chicken? Well Auntie Yeong and Joanne explains that the iced chicken creates a layer of jelly under the chicken’s skin making the chicken more tender, succulent and jam-packed with flavour. The Bird Flu did not make them Chicken Out. Perseverance is all you need! When the bird flu epidemic hit in 2005, Ming Kee’s business was heavily impacted. People were rightfully paranoid of eating chicken related dishes and Ming Kee’s Chicken Rice was no exception. But Auntie Yeong and her family persevered through the hard times, maintaining high standards and quality service. With their resilience, they emerged through the bird flu epidemic with the rightful claim of being the best chicken rice in Bishan. Ming Kee’s Chicken Rice has a strong hold on being the best chicken rice in Bishan, but are they in the conversation of being the best in Singapore? Remember to wear your most comfortable shoes and go queue! Try it out and let us know! Next articleThe Leaning Tower of Pisa! And The Leaning People of Pisa?